When you get a bruise, it can be annoying. You know that your body just needs time to heal since your injury. Most of the time, your bruises happen because of an obvious injury. You may have bumped into furniture when you woke up at night or tripped on something. Bruises can come from things other than an injury though. A bruise occurs when you have broken blood vessels under your skin. Once they are broken, they start to look black or blue in color. 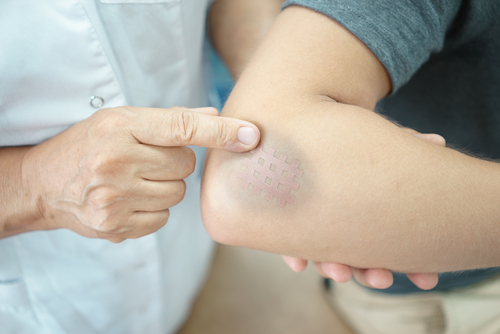 A bruise can come from a number of things other than just an injury. It could also come from a bleeding disorder, overusing the body part during exercise or using blood thinners. In most cases, your bruise should heal within about 7 to 10 days. If the bruise does not go away in this time frame, then there may be something more serious wrong. This medical condition happens when a bone grows into your soft tissues. When this bone causes friction against the tissues, then it may rupture a blood vessel and lead to chronic bruising and bleeding. Your body needs a variety of vitamins and minerals to function properly. If you are deficient in some of these nutrients, then your body may not be able to heal properly and you may have problems with blood clotting. You need vitamin K for proper blood clotting. If you have a deficiency, then you are more likely to develop bruises, and those bruises may hang around for longer. If you have a zinc deficiency, you can develop anemia and excessive bruising. Zinc is normally responsible for improving wound healing and nourishing the skin. Likewise, bioflavonoids also nourish the skin and your blood vessels. You also need vitamin C to keep your blood vessels healthy and ensure proper wound healing. There are several different medications and supplements that can increase your chances of bruising or having prolonged bleeding. These medications generally have this effect because they thin the blood, which makes bruising more likely and the blood is not able to clot properly. One common supplement known as omega 3 fatty acids are known to increase the risk of bruising and bleeding. Blood thinners like aspiring, warfarin and heparin thin your blood and can make bruises that won’t go away. Selective serotonin reuptake inhibitors (SSRIs) are used for anxiety or depression, but they can also lead to bruising problems. Likewise, non-steroidal anti-inflammatory drugs (NSAIDS) have blood thinning properties that can increase bruising and your risk of having internal bleeding. An injury that causes your blood vessel to rupture and start bleeding can cause a large lump. The blood clots near the rupture, but people who have bleeding problems or who are on blood thinning medication may have ongoing bleeding. This can cause a bruise-like coloring over the lump on the skin. One side effect of chemotherapy is a reduction in blood platelets. These platelets normally help your blood clot after an injury, so you are more likely to have a bruise or bleeding that does not go away if you are being treated with chemotherapy. This condition is a blood clotting disorder that happens because there is a low level of a type of protein that is needed for clotting. It can cause non-stop, heavy bleeding and bruising. Everyone ages, and there are natural changes that occur to the body. As you get older, your body is less able to heal. This means that you will bruise more easily, and it will take longer for the bruises to heal. This is because the walls of your blood vessels are gradually growing weaker. Another potential cause of slowly fading bruises is a collagen disorder. If you have a faulty collagen gene, then the blood vessels may rupture more easily. One type of collagen disorder is known as Ehlers-Danlos Syndrome, and you may bruise easily if you have this disorder. This medical condition causes you to have low levels of blood platelets, which makes it harder for your blood to clot. Because of this, you are more likely to have a bruise or prolonged bleeding. The bruise will also take longer to heal as well. This is a genetic disorder that means your blood does not clot like it is supposed to. If you become injured, you may develop internal bleeding, bruising and uncontrollable bleeding. You may need a blood transfusion to make up for the blood that your body loses. If you have an underlying medical condition causing the bruising, you should treat that condition. Go to your doctor to be checked out. If you have a bruise that just seems to take longer than normal to heal, there are a few at-home remedies that you can use. Eat Vitamin K: Vitamin K is needed by your body to make sure that your blood can clot and your bruises can heal. Make sure to eat plenty of vitamin K rich foods like prunes, broccoli, asparagus and greens. Vitamin C: In addition, make sure to get enough vitamin C to help your wounds heal. Just makes sure not to go over 1,000 mg a day or it could actually increase your risk of bleeding. Sugar Pastes: Mix sugar and drops of water to make a paste. Apply the paste to the bruise and wrap it in a bandage. This should help prevent the bruise from growing larger. Rest and Ice It: Try not to use the area with the bruise on it for at least the first day. You can apply an ice pack for 10 minutes on and 20 minutes off for several hours. The ice pack will help to reduce the swelling and bruising. To make sure that you do not get frostbite, make sure to wrap the ice pack in a towel or a similar cloth. Ace Wrap: A compression bandage may be able to stop the bleeding under your skin and help with the clotting. It should be done once you notice the bruise, but make sure not to do it too tight or you could cut off your circulation. Chocolate: Chocolate has anti-inflammatory properties, so melt some chocolate with a high cocoa content and smear it onto the bruise. This is supposed to help tighten the blood vessels to help your bruise go away. Previous articleWhat Does Sexually Active Mean? Next articleCan a UTI Go Away on Its Own?